Leonardo of Pisa, also known as Fibonacci, was a brilliant Italian mathematician who is known by several different names: Leonard Pisano Bigollo, Leonard Pisano, and Leonardo Bonacci. 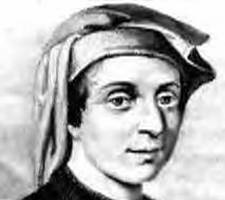 However, Leonardo is so famous for his contributions to mathematics that he is routinely referred to by only one name, much in the way Madonna and Beyonce are today: he is known simply as Fibonacci. Today, many students probably recognize the name from the famous sequence now know as the Fibonaci numbers - a number sequence that is generated by adding the previous two terms to create the current term. "Leonardo" is not credited with discovering this sequence, but it was named after him because he shared it with the Western world in his famous book on mathematics the Liber Abaci, which translates to Book of Calculation. The further you continue the sequence, the close the ratio of successive numbers gets to the golden ratio. The golden ratio is approximately 1:1.618. The golden ratio has countless connections to the natural world, including the human body. Rectangles with sides in proportion to the golden ratio, are said to be golden rectangles. A golden rectangle is believe to be the most visually appealing. Artists contend that people are naturally more drawn to a rectangle that fits the proportions on the left. There is no such thing as a "silver rectangle," but you can see the proportions are much different. Instead of the ratio being about 1.6:1, it is over 3:1. Which one do you prefer? Want to impress your parents? Ask to measure the ratio of their credit card. I bet it is pretty close to the golden ratio! Return from Fibonacci to other Famous Math People.